Purists can note that this is the original version of the hymn; I gather Joanna Bogle has written a new version, though I've never seen it. 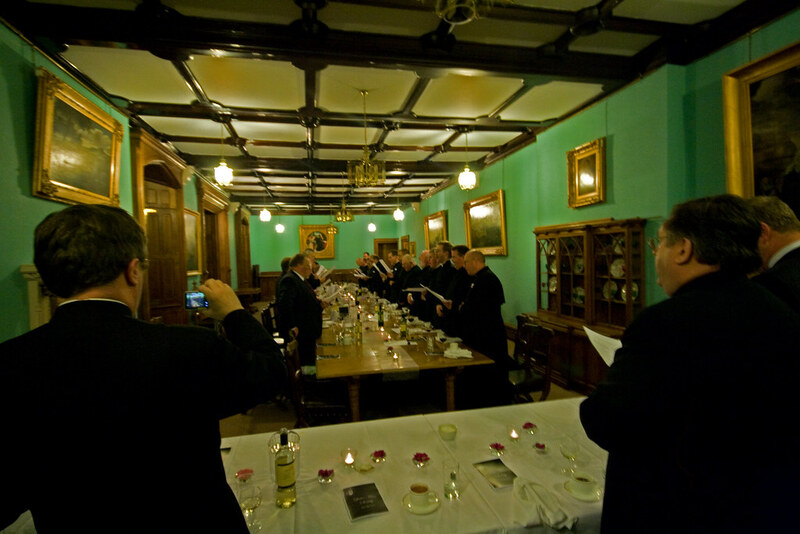 Hillaire Belloc would have been able to predict the mood at the Conference dinner of the LMS Priests Training Conference in Ushaw. 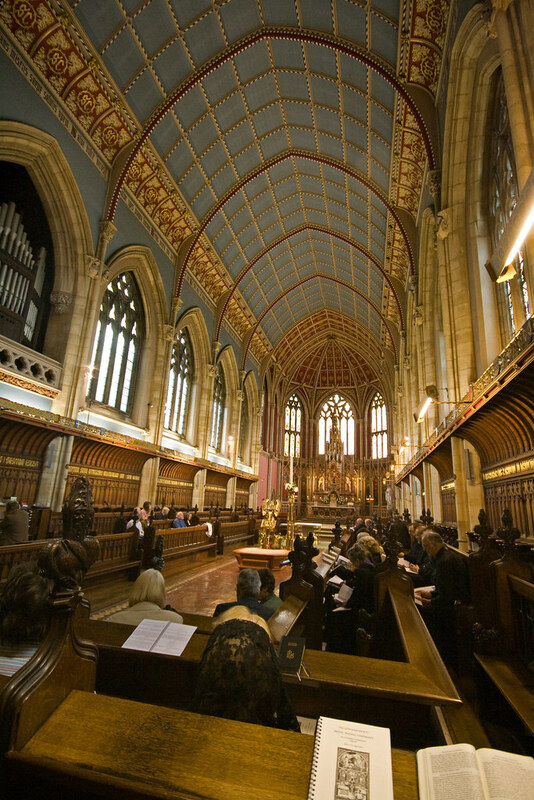 Although (in the 'good old days') the boys' school which shared the site with the seminary had an austere reputation, and the seminary prompted some mixed feelings with priests who had trained there more recently (one warned us against scheduling future conferences there in February...), the LMS conference was a joyful occasion. The men who built Ushaw may not have been very generous with second helpings of suet pudding but they cared a lot about architecture. The main chapel is stunning, and it is surrounded by tiny chapels intended for private Masses, all of them beuatifully and elaborately decorated. 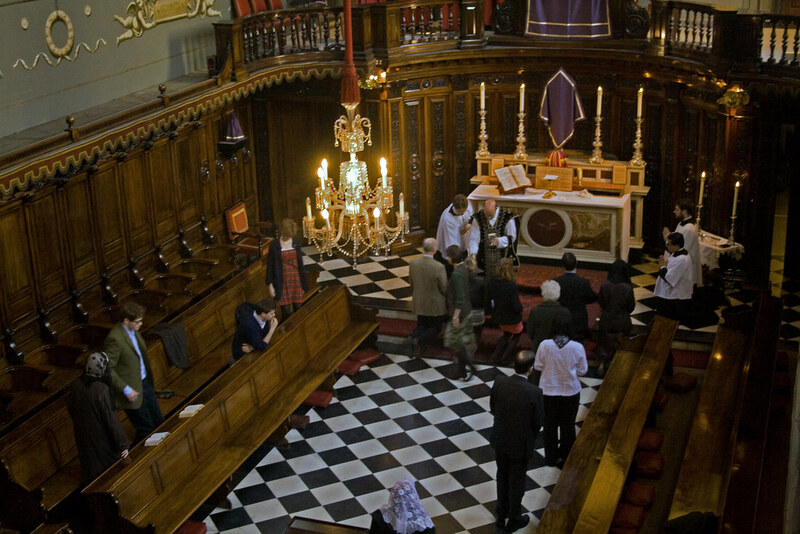 These chapels, which can't have seen many Masses since concelebratation became the norm in the 1970s, were used so heavily at the Conference, that private Masses - nearly all of them Traditional - had to be scheduled in two waves, at 6.15 and 7.15am, followed by Lauds at 8am (which itself was followed by breakfast). 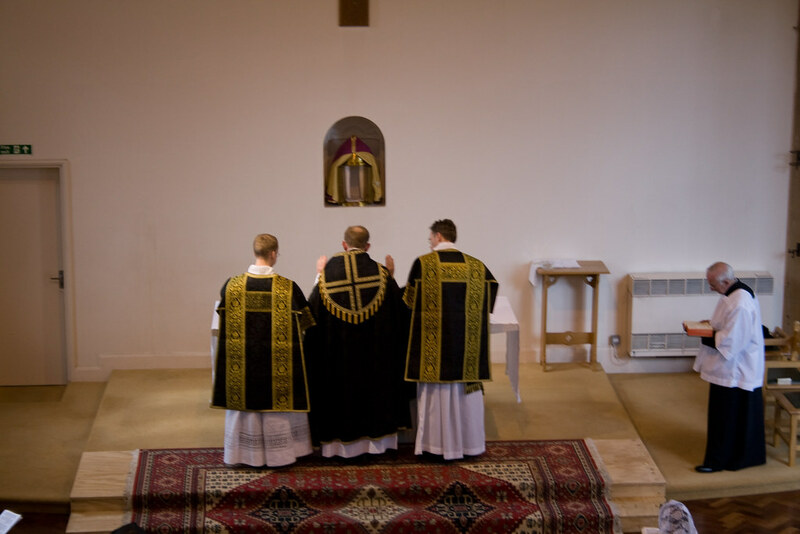 I was privileged to serve two Masses yesterday morning, first of Fr de Malleray FSSP, who had been giving tuition at the conference, and then the irrepressible Canon Noonan, who attended the conference as a trainee. 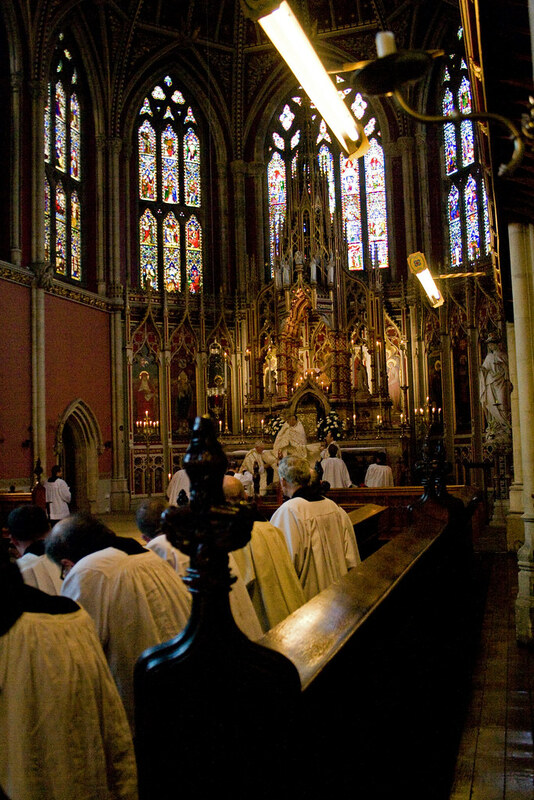 For my money the glorious sight of the great chapel with Solemn Mass, with two choirs, more than a score of priests in choir, and a good number of local faithful, was surpassed by the bustle of the enormous sacristy and the whisper of private Masses at innumerable altars in the early morning. 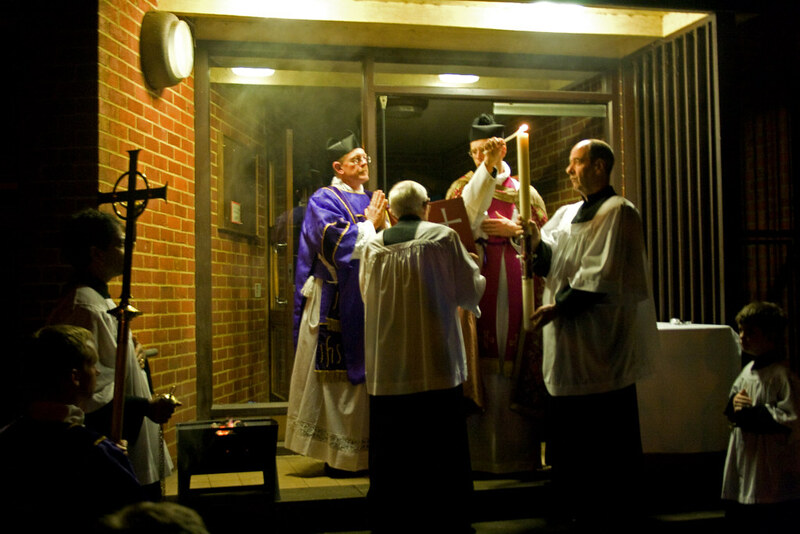 Traditional groups have long been able to put on the occasional 'big Mass' in a nice church, but what the conference represented is the re-establishment of the Traditional Mass as part of the tool-kit of parish priests all over England (and not forgetting a participant from Glasgow). 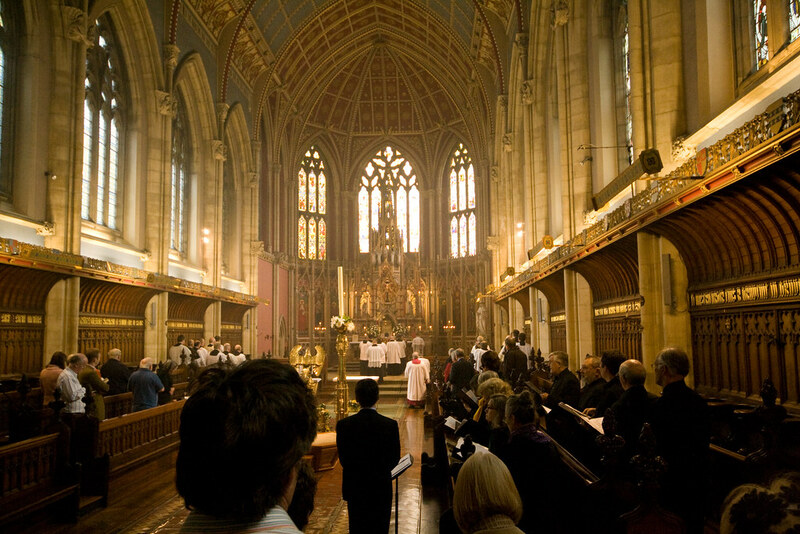 It is wonderful to see Ushaw College doing what it has done for two centuries: enabling the training of priests in the Church's great liturgical tradition. 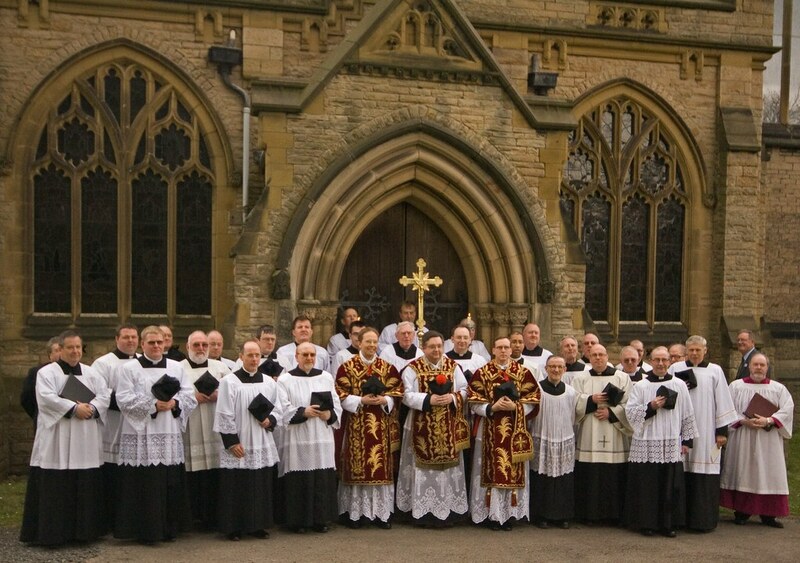 I'm just back from the LMS Priests' Training Conference in Ushaw, the historic seminary of the North of England. Here are some photographs. Benediction of the Blessed Sacrament in the wonderful main chapel of the seminary. 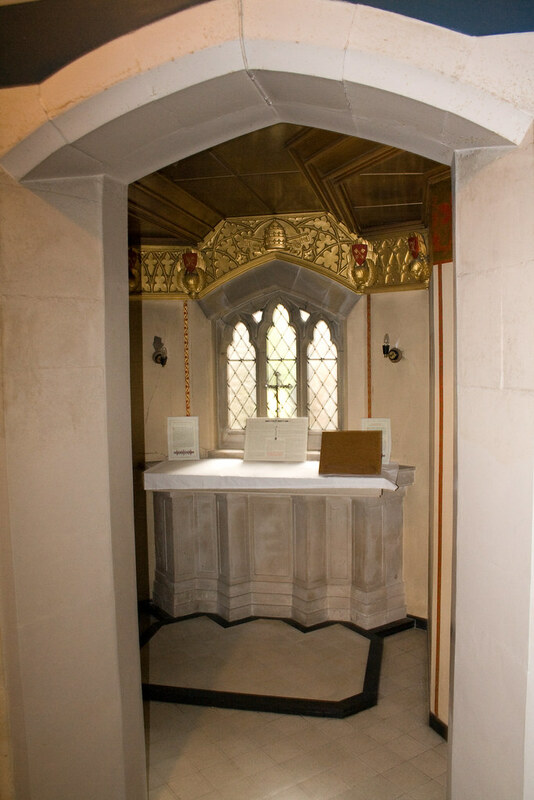 The seminary chapel was built by Pugin, and then dismantled and rebuilt, much larger, by Hanson and others. There was a litugical schola, in cassock and cotta, at the Offices (Vespers and Lauds) and to sing the propers at Mass. These were led by Mike Forbester of the Rudgate Singers. 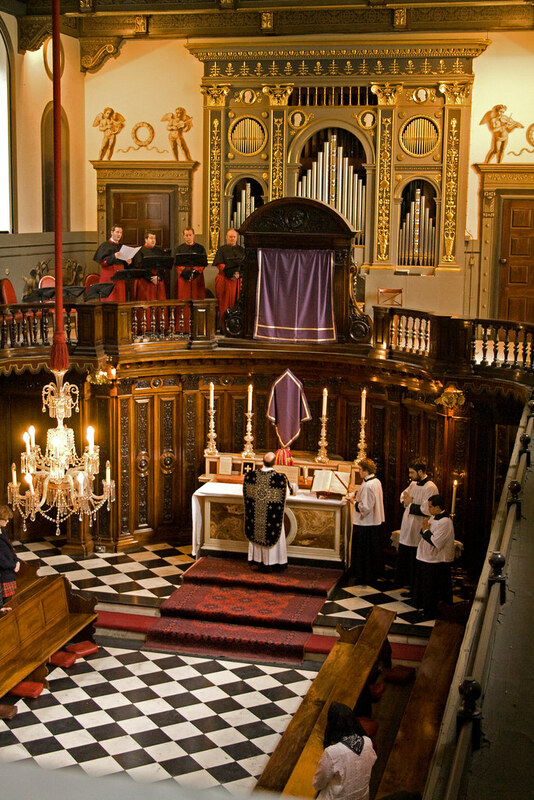 At the Solemn Mass on Thursday Mike arranged the assistance of an excellent polyphonic choir, Antiphon, who sang Byrd's Four-Part Mass, under the expert direction of Christian Spence. 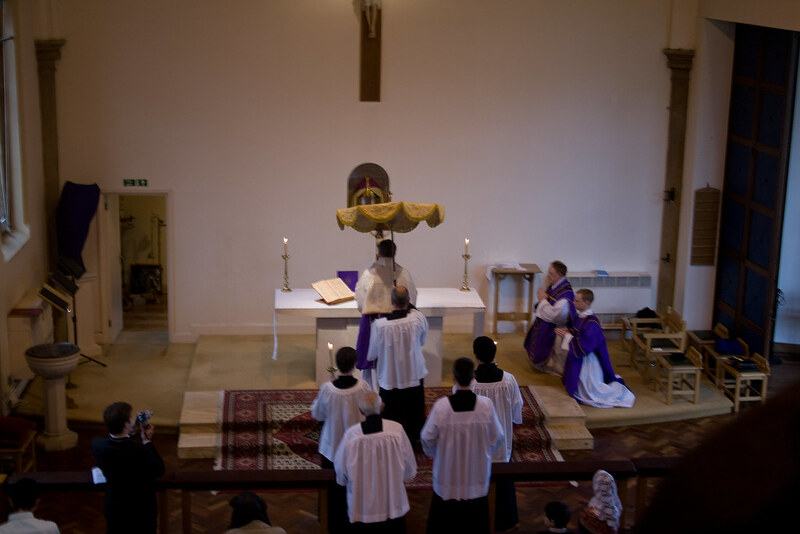 Mike has quite a lot about the organisation and the liturgies on his own blog, Rudgate Ramblings. Pictures of the conference are appearing all over the blogosphere: see in particular Middlesbrough LMS and Fr Brown at Forest Murmers. See also my Flickr set. In a wide-ranging article in this week's Catholic Herald, Fr Leo Chamberlain OSB reflects on the two 'forms' of the Roman Rite. I knew Fr Chamberlain of course from his time as Master of St Benet's Hall, where I was (and still am) a Fellow. It is interesting to hear the experiences of the generation of priests who were, as he explains, the first not to learn anything other than the Novus Ordo. 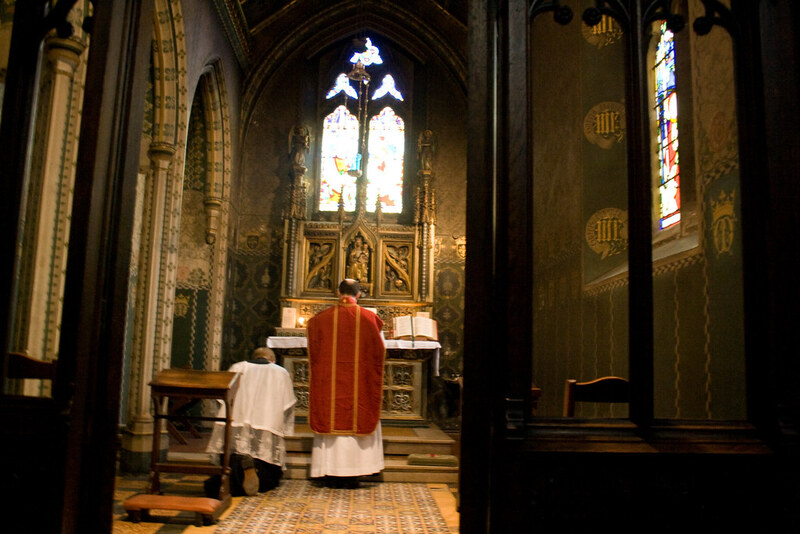 He remembers the problem of priests racing through the Mass in the 1950s; he is equally aware of the 'arbitrary deformations' of the new missal which have shaped the liturgical experience of most people since 1970. However, the article ends with a rather strange paragraph. ...we should all use the terms used by the Pope. I have tried to do so in this article. It is offensive to speak of "traditional Mass" as do the advertisements of the Latin Mass Society. We are all of the tradition, we all celebrate within the tradition, and our unity depends on our recognising it. It is odd in part because, however hard he tried, Fr Chamberlain has not, in general, succeeded in using the 'terms used by the Pope'. Not that I object to the development of the vocabularly. Fr Tim Finnigan, for example, has adopted the 'usus antiquior' / 'usus recentior' distinction (using the Latin terms). If Fr Chamberlain wants to talk about 'old' and 'new' forms he is free to do so; it seems to flow from the terms 'new Mass' and 'old Mass' which have had a long currency. But they are not the terms used by the Pope. It is worth asking why the Holy Father adopted the vocabulary he did. It is important to remember that the Motu Proprio is a legal document, and makes a very important legal point: that the 1962 Missal was never abrogated, and should be regarded as a legitimate version of the Roman Rite. The 1970 Missal is the 'ordinary' form of the Rite; the 1962 Missal is accordingly an 'extraordinary' form. This is not simply a statement of fact: it is a legal enactment. The Holy Father is not, as a scholar, contradicting the great Klaus Gamber, who said that the 1970 Missal could not be regarded as a form of the Roman Rite. He is making it true, not as a historical, liturgical judgement, but as a matter of the law of the Church, that the two Missals are two forms of a single Rite. 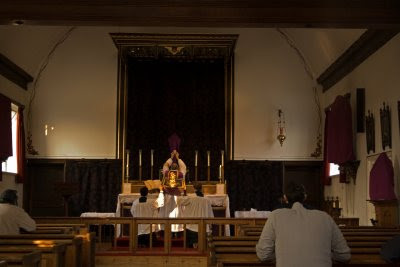 To enact that they are two forms of a single Rite (neither of which tied to a particular locality or religious order) is to enact that every priest of the Latin Church, trained in the 1970 Missal, has the right to use the 1962 Missal. 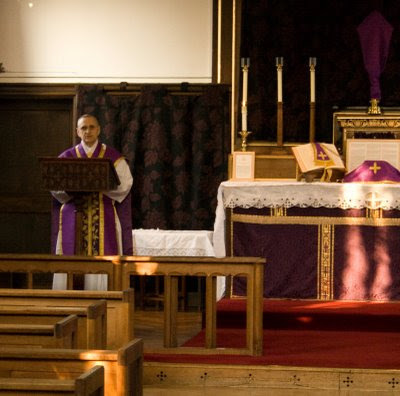 If they were, legally speaking, two Rites, then a priest of the 'New Rite' would have to get a special permission to celebrate a Mass of the 'Old Rite', just as a Latin Rite priest cannot, without special permission (granted for special reasons) celebrate a Mass according to the Greek Rite. The Holy Father, a liturgical scholar of great importance himself, is not trying to close down the long-running debate about the nature and implications of the liturgical reform, to which he has made his own contributions. Still less is he attempting to enforce terminological uniformity. Why it should be imagined he is doing the latter is frankly beyond me - what would be the point? - but if proof were needed it was provided by Cardinal Castrillon Hoyos, in the famous interview he gave during his visit to England last year, when, in defending and explaining the Motu Proprio, he repeatedly referred to the 'Gregorian' Mass: indeed, on three occasions he calls it the 'Gregorian Rite'. Cardinal Hoyos is not making a legal point by using that term. He is not suggesting, for example, that the different Masses should be said only be the priests of mutually exclusive 'Rites'. He is using 'Rite' in the extremely well-established looser, non-legal sense: compare 'Sarum Rite', 'Dominican Rite', 'Gallican Rites': legally speaking these are all probably 'uses'. And he is referring to the Mass as 'Gregorian' to make a historical point: contrary to the suggestion that this Mass is, in any important way, a product of the Council of Trent, it is actually the Mass of Pope Gregory the Great. Equally, however, a useful point can be made by talking of the 'Missal of Blessed John XXIII', as the Holy Father describes it in the Motu Proprio, or even as 'the Mass of the Council' (ie Vatican II): it reminds us that as well as being of great antiquity, it was the ordinary used form of the Roman Rite even for Pope John XXIII and during the Second Vatican Council itself. The notion of terminological uniformity arising out of all this is pretty far fetched. But what of the term 'the Traditional Mass', or, as the legal name of the Latin Mass Society has it, 'the Traditional Roman Rite'? Well, clearly the term 'traditional' is descriptive and widely understood. 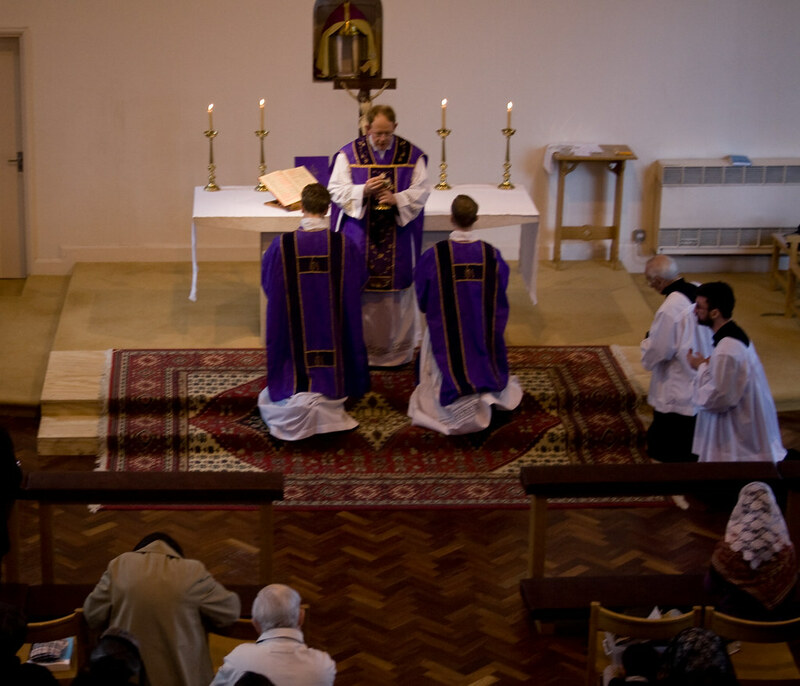 The Mass we are referring to is the traditional as opposed to the reformed version. It also draws attention to the fact that the 1962 Missal is 'traditional' in the sense that it had not been altered much from previous editions, going back over enormous stretches of time. Not only does the 1970 Missal represent a significant change, but - as its designers intended - it ushered in an era in which there would be more changes as time wore on. Since 1970 there have, for example, been a large number of new Eucharistic prayers authorised for use. There have been successive changes to the rubrics, as various new practices have been permitted. As I write we are preparing for a substantially new English translation. This all represents a different attitude to the Missal from what might be called a 'traditional' attitude, which emphasises the idea that what has been handed to us should be handed on to the next generation as faithfully as possible. This suggests that the term 'Traditional Mass' makes perfect sense. It is reinforced by some interesting terminology adopted by a number of Vatican officials, referring to the 1962 Missal and its surrounding books and customs as 'the former liturgical tradition'. Cardinal Meyer used this term in his well-known letter othe American Bishops of 1991; it has been used many times since, in the context of the people 'adhering' to this tradition. The term 'usus antiquior' seems related to this: it refers to a liturgical tradition or usage with which the 1970 Missal is not in complete continuity. One can make a distinction between the tradition up to 1969, as Klaus Gamber did, and what happened in 1970 and subsequently. One cannot read very far into the Holy Father's great book 'The Spirit of the Liturgy' without realising that he acknowledges this discontinuity of tradition himself. It forms the great problem of the liturgy today, to which, as Pope, Benedict XVI is clearly concerned to address himself. To claim, as Fr Chamberlain does, that acknowledging this discontinuity is 'insulting' is, it seems to me, an attempt to deny the obvious. To his great credit, this is not something which Holy Father, and indeed the Vatican in general, have any wish to do. This is the church served by the priests of the Fraternity of St Peter. Sunday 10th May will be Sung. Our all-male schola rehearses before Mass every week, so we have two weeks to prepare for each Mass. If you'd like to get involved in singing, do get in touch! Sunday 10th May 2009 3 p.m. I've had this by email. During the weekend of the 18-20 September 2009. Young Catholic Adults will be running a Traditional Retreat at Douai Abbey, the retreat will be led by Juventutem Ecclesiastical Leader Fr de Malleray . Mass will be in the Extraordinary form. 45 pounds for students/low waged/unwaged. To reserve your place FOR THE WEEKEND (no deposit needed if you are coming for the day on Saturday 5th July), please a 20 pound deposit (NON RETURNABLE) to Damian Barker, Flat 5, 12 St. Catherine Street, Kingsholm, Gloucester, Glos. GL2 9DU (please make any cheques payable to Damian Barker). We started at 10pm and finished at about 1.15am. A joyful occasion: Christ is risen! 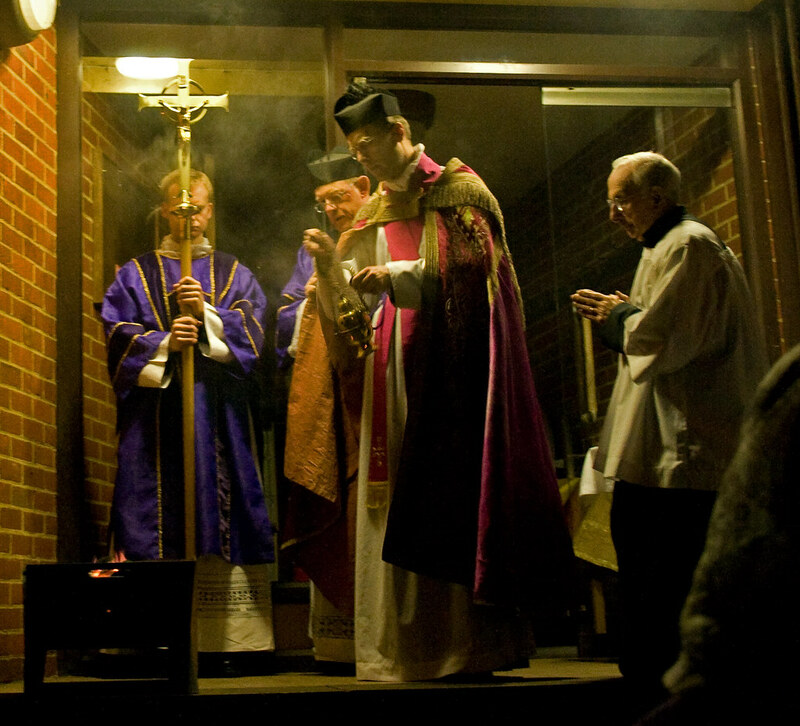 The blessing of the fire. 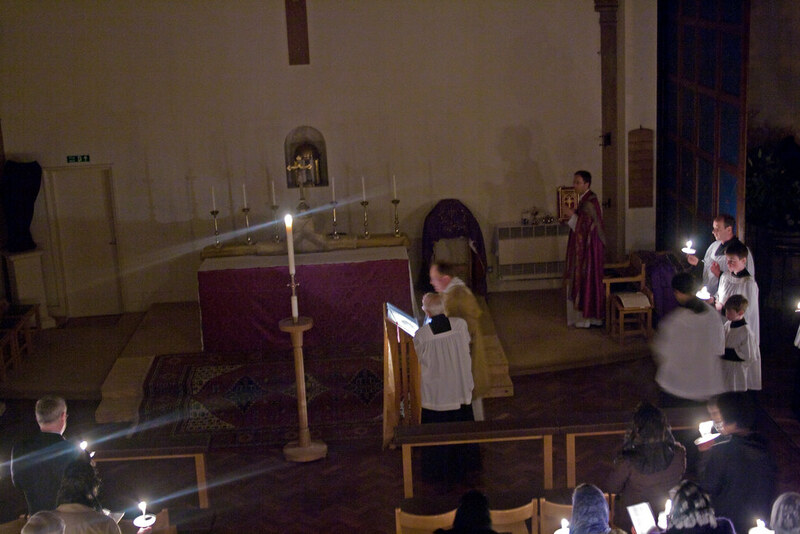 The lighting of the Pascal candle. The lights were not turned on until the Gloria. The photographs give a misleading impression: it was extremely dark in the church until then. The Exultet, sung by Fr Leworthy. Mass. Fr de Malleray is celebrant. The end of the liturgy. More photos in my Flickr set. The Solemn Liturgy on Good Friday is a remarkable and complex thing, going through distinct phases with the clergy in different atire at different stages. I'm not qualified to do a commentary but I've given some indication of what is going. See also my Flickr set. 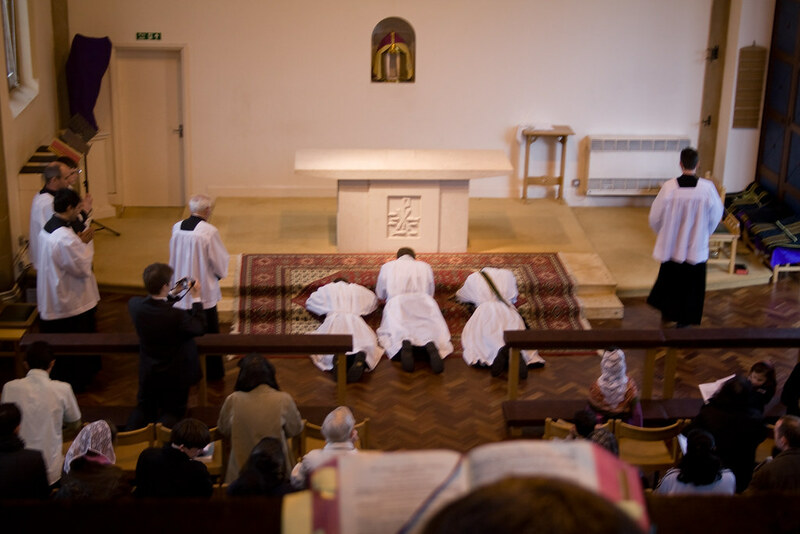 The minsters prostrate themselves at the start of the liturgy. The sing the Passion of St John. The Creeping to the Cross. 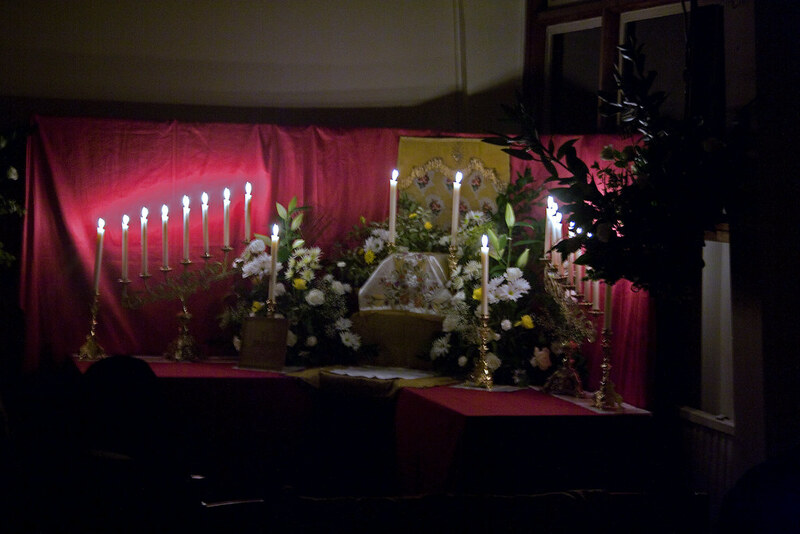 The Blessed Sacrament is brought from the Altar of Repose. Ecce Agnus Dei: the 'Mass of the Pre-Sanctified'. 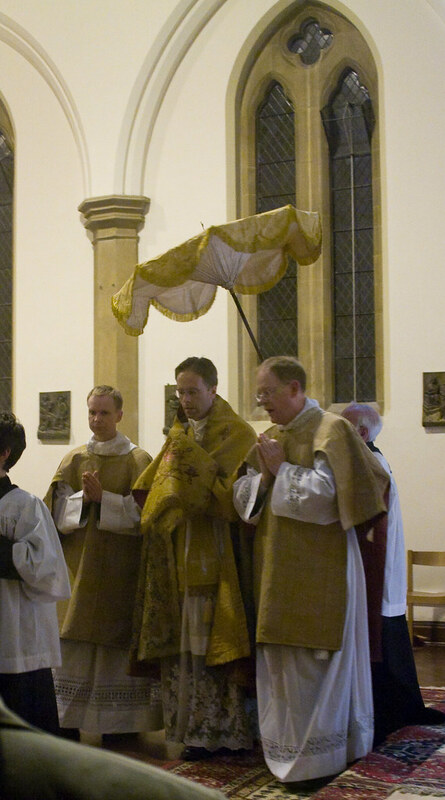 Fr Leworthy was celebrant, and Fr de Malleray was deacon; the Rev Mr Sypher was subdeacon. Another wonderful Solemn Mass at which I had the privilege to sing. The ministers were the same as Palm Sunday. I took a lot of photos: here are a few. 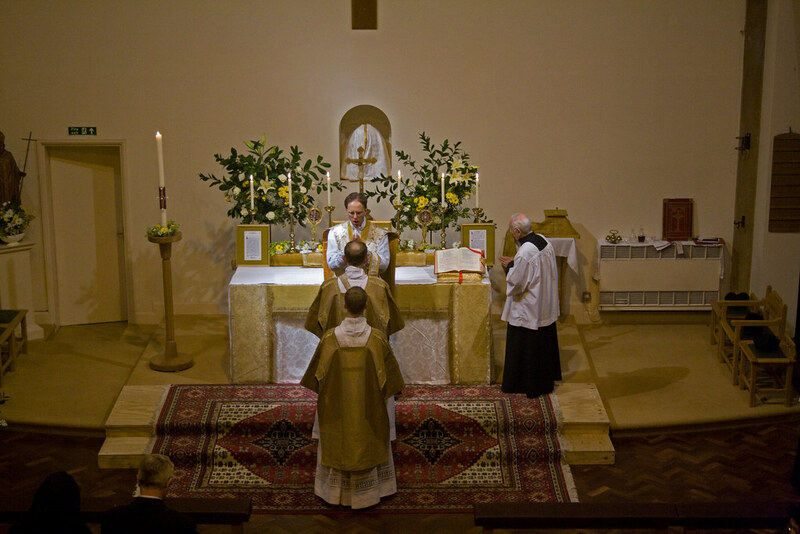 Notice the special care with which the altar is arranged, with flowers and (what I have not seen before) reliquaries. This adds to the contrast when the altar is stripped bare at the end of Mass. You can see the rest of the photos on my Flickr set. At the time of posting this they are still uploading. 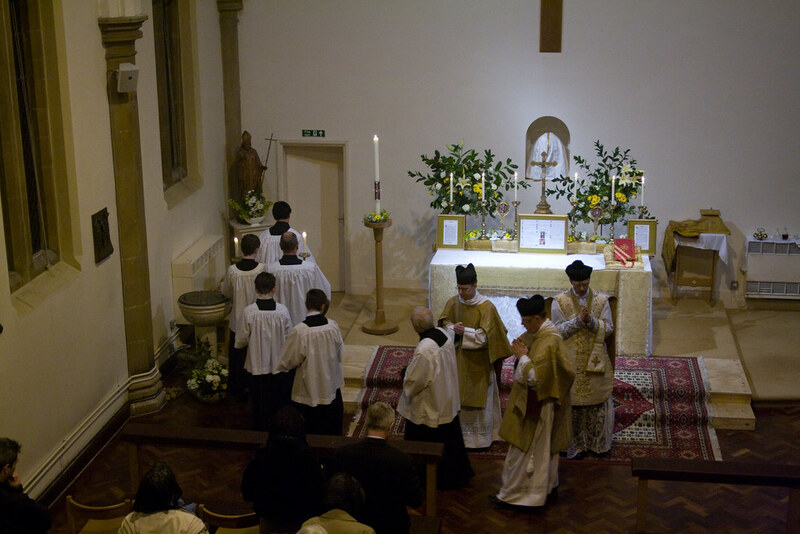 At the end of Mass there was the usual procession to the Altar of Repose, which was very beautifully arranged, the stripping of the (usual) Altar, and the special version of Compline for the day, in which the small schola and the ministers alternated. There are more photographs on my Flickr set. I was singing in the choir on this occasion, as I will be also over the Triduum. Solemn Mass was even very recently a real rarity in this country. For years the only time I witnessed it myself was in the annual Mass at Portsmouth Cathedral. It is wonderful to see it coming back into routine use. 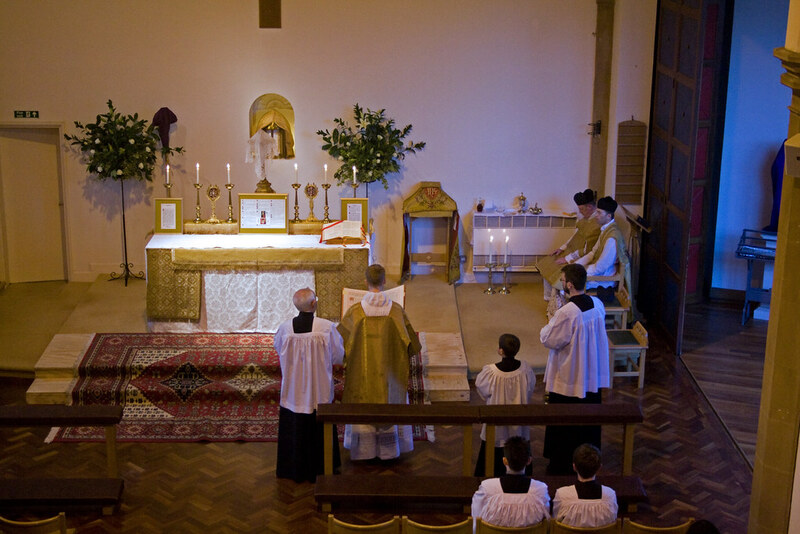 We have of course had Solemn Mass for the Oxford Pilgrimage for several years now; the Newman Society termly Mass was a traditional Solemn Mass some time ago, and there will be a Solemn Mass on Sunday 12th July in SS Gregory and Augustine at 10.30am, which will be accompanied by a visiting choir from Poland, the Cantores Pueri Polences. You can now download the 'Dowry', the Newsletter about the Fraternity of St Peter's activities in England, from the LMS's own site here. in Oxford are now arranged and are available here. St Joseph the Worker, 1st May, will see Low Mass at the Oratory at 12.15pm and Sung Mass at SS Gregory & Augustine at 6pm; Ascension, 21st May, will see a Sung Mass at the Oratory at 12.15 and a Low Mass at SS Gregory & Augustine at 6pm. 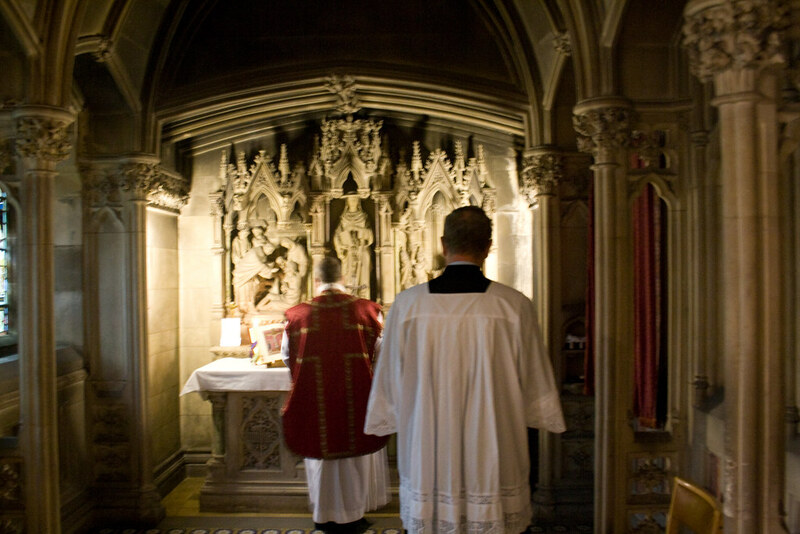 As usual there will be a Sung Mass in the Oratory for Corpus Christi, 11th June, at 12.15. There are two special events this quarter. The annual Chant Training Day will take place on Saturday 23rd May at SS Gregory & Augustine; please get in touch with me for the full details. There will be Sung Mass at 3.30pm to which all are welcome. 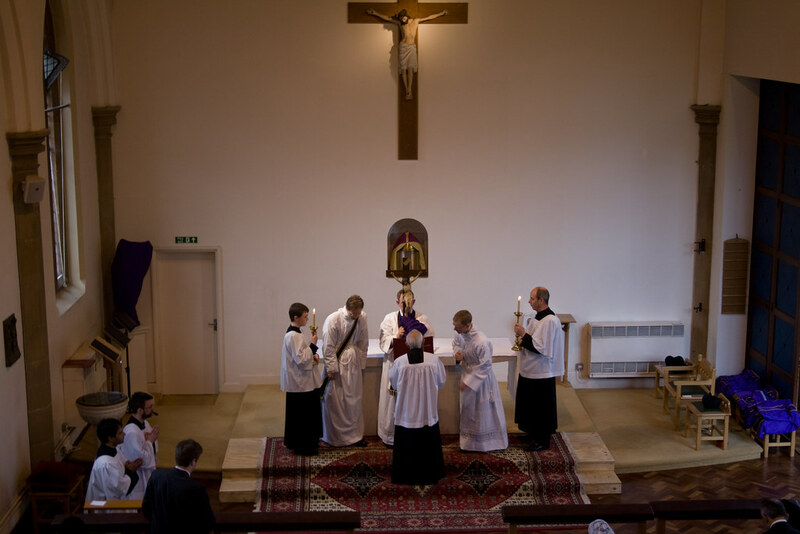 And there will be a Sung Mass in Mapledurham House, the historic Catholic house outside Reading, on Sat 30th May at 11am. Please support these Masses! There has been a change of date so I'm bumping this back to the top: the next event will be on 2nd May, not the 9th. 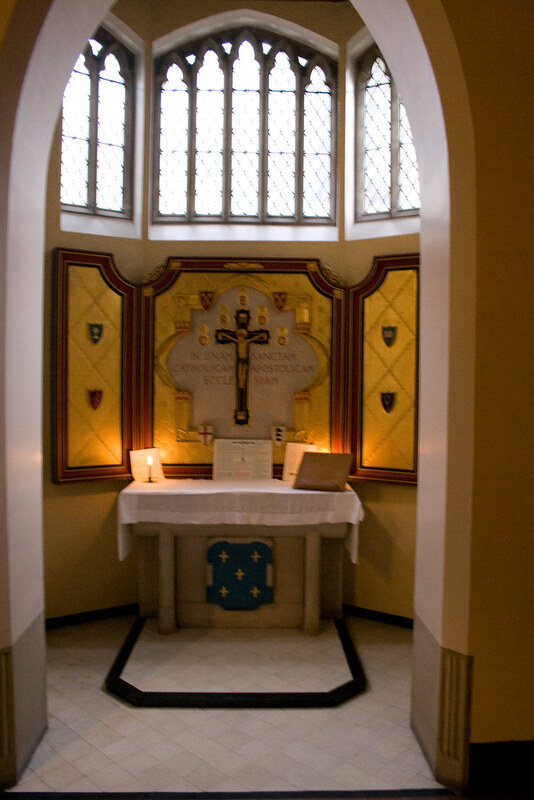 The days start at 11.00 with Traditional Sung Mass is the superb, un-sullied Pugin chapel of the school, and continues after a picnic lunch with catechism and activities for chidlren of different age groups, and talks for the adults as well. I did a post about it here. 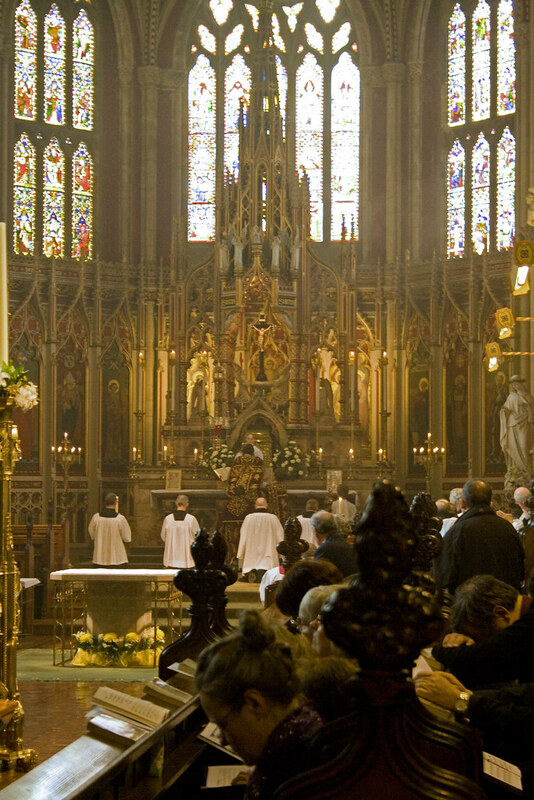 My eldest sister died five years ago, and I arranged a Requiem Mass for her in the London Oratory, where more of my family could attend than in Oxford. The Mass was sung by Fr George Bowen Cong Orat, accompanied by members of the well-known Oratory Choir. At the last minute I was roped in to serve. I have actually never served Sung Mass before; I am usually singing myself! The ceremonies for a Requiem are pretty simple, however. The Choir were first rate - as they always are. 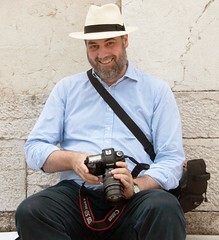 Many thanks to the Director, Patrick Russill. 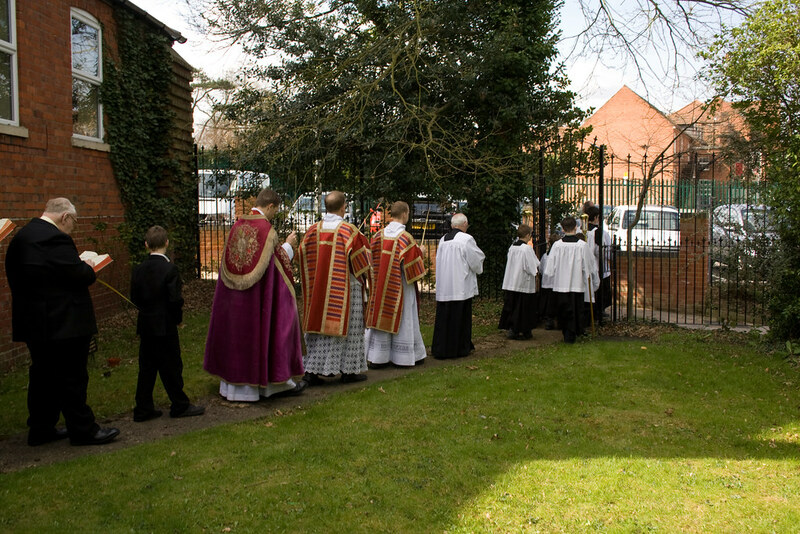 Mass took place in the charming 'Little Oratory', which is the other side of the car park from the main church. There are more photographs on my Flickr set. 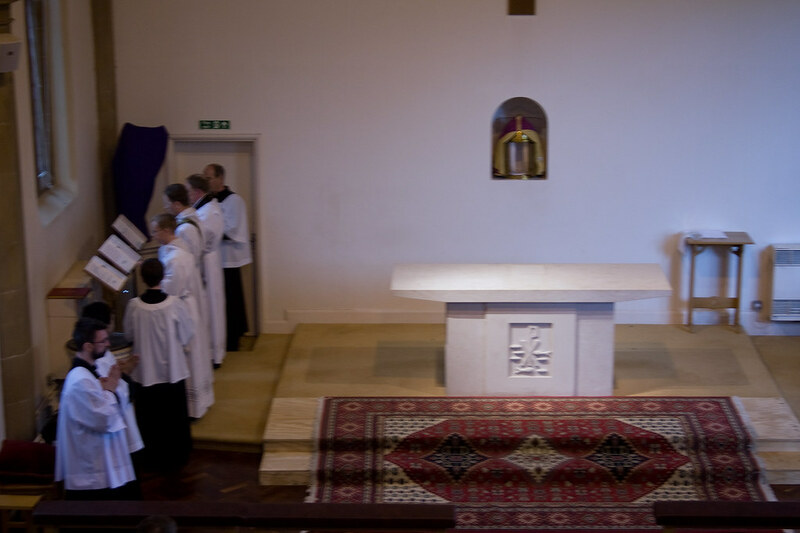 I was recently in the Little Oratory for Mass celebrated by Fr de Malleray when he launched the FSSP's tutorial video of the Mass: see my post on thate here. 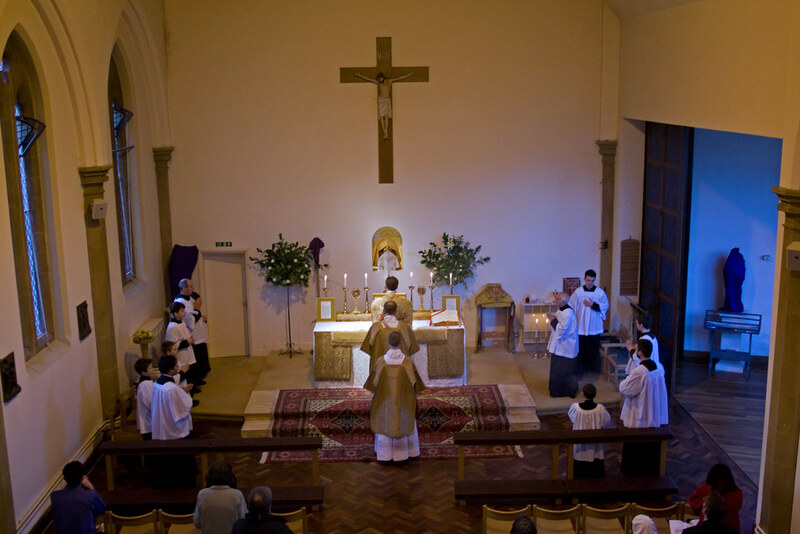 It is nice to have some photos of Mass in this chapel taken in daylight! The appalling attack on Fr Tin Finnigan by The Tablet a few weeks ago has sparked a sustained discussion in the letters pages, at first about Fr Finnigan but now about the traditional Mass in general. I highlighted one excellent letter, from Richard Duncan; I myself responded to a letter in the last issue. They cut my letter a little; here's the uncut version. Professor Orsy SJ (Letters, 28 March) makes the interesting point, from his own experience at the Second Vatican Council, that no-one imagined the mooted ‘reform of the liturgy’ would create a ‘new rite’ which would exist alongside the continuing use of the ‘old’. He concludes that the 1970 Missal should have been understood to have simply replaced earlier ones as new editions usually replace older ones. This assumption would indeed have been reasonable to people involved in the Council itself, which gave a strictly limited mandate to the reform, stating ‘there must be no innovations unless the good of the Church genuinely and certainly requires them; and care must be taken that any new forms adopted should in some way grow organically from forms already existing.’ (Sacrosanctam Concilium 23). What actually happened was rather different, and liturgical scholars, both those critical and those favourable of the reform, recognise the 1970 Missal as something substantially new. 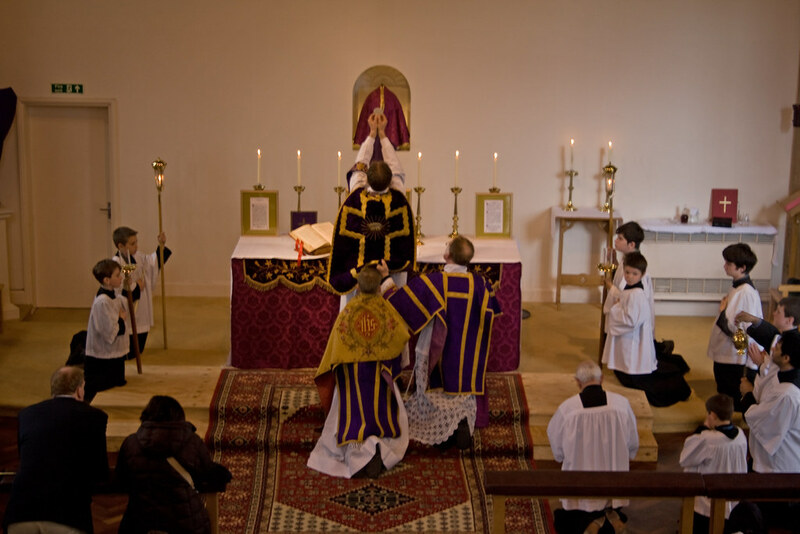 There is no precedent in the history of the Roman liturgy for a long-established Rite to be forbidden by legislative fiat. There is also no precedent for what comes to the same thing, a reform of an ancient rite which changes it substantially and replaces it. It therefore becomes an open question whether Paul VI intended to forbid the use of previous editions of the Missal or not. A commission of Cardinals in 1986 concluded that he had not; Pope Benedict’s Motu Proprio makes this conclusion the clear law of the Church. Professor Orsy claims that there is no precedent for two Rites existing side by side. But as he admits there have been many regional ‘rites’ (or ‘uses’), and many rites/uses of particular religious congregations. The fact is that in the past dioceses were quite untroubled by the presence within them of Domincans, Premonstatensians, or Cistercians, with their distinct Missals. This pluralism opened up to ordinary Catholics multiple expressions of the Church’s great liturgical tradition. It is to be hoped that the spread of the Roman Rite’s usus antiquior will do the same thing. An important bit of local news: our very own Archbishop is moving to Westminster to be Archbishop there. He will be installed on Thursday, 21 May 2009. He has been Archbishop of Birmingham since 2000; before that he was an auxiliary bishop in Westminster. We wish Archbishop Nichols well in his new post. He faces the challenge of leading the Church in the context of the current persecution. But he has been at the forfront of the battle for some time. Let us support him with our prayers. Here is the press release. Interestingly it says that, according to custom, Archbishop Nichols won't be made a Cardinal until Cardinal Murphy-O'Connor reaches the retirement age of 80, ie 2012. After attending the Kent Day of Recollection yesterday I drove to the House of Commons for the launch of 'The Nation that Forgot God', a collection of essays about secularisation. It is edited by Edward Leigh MP and Alex Haydon; Mr Leigh hosted the launch in his Commons office. Edward Leigh (pictured) is a Catholic MP in more than name only. He is a founder of the Cornerstone Group, a 40-strong group of Conservative MPs who beleive in the 'spiritual values which have informed British institutions, our culture and our nation’s sense of identity for centuries, underpinned by the belief in a strong nation state'. He is also active in the pro-life cause. The list of contributors to the book is extremely impressive, including my own ordinary, Archbishop Nichols of Birmingham, who has spoken out frequently in defence of the Church against the Government's attacks, notably on the Sexual Orientation Act; Roger Scruton, now a Fellow of Blackfriars, the Dominican Hall in Oxford University; Dom Aidan Bellinger, Abbot of Downside, and the Anglican Bishop Nazir-Ali, who caused a storm by suggesting that the Anglican Church should be making an effort to convert Muslims living in the UK to Christianity. 'Perish the thought' seemed to be the reply of the Anglican establishment. The launch was attended by Abbot Bellenger and a number of politicians, including Iain Duncan-Smith. "Our politicians seem to live in a different world, a world that is purely secular and material, a world that does not permit a mature consideration of the key role of religious belief. "Behind this is the assertion that religious influences are bad for you, and that ignorance of religion is better than exposure to it and the study of it. "Why is this so? It lies in the distorted and truncated notion of reason which shapes our society and, to a large extent, the education it offers. "Quite simply we have sold our soul to a positivistic understanding of reason. By this is meant that knowledge and reasoning are limited to what can be positively seen, measured and physically tested through hypothesis, experiment and observation. "Moral reasoning overcomes the.. 'individualism' of a positivist culture. "A society which limits itself - and its education - to a positivistic understanding of reason will find itself unable to determine shared moral principles and values. Such a society will lack cohesion." I think this is an extremely helpful way of articulating the problem: that what we are facing is not just a different way of life, but a different conception of rationality. To argue with a rival theory of rationality is certainly possible, but one must be on one's guard when one's opponents appeal to 'rationality' as the final arbiter. I have myself touched on this aspect of the problem of secularisation here.